Tropical means ‘Tropical Region’, and Evergreen means ‘green leaves throughout the year’. Usually occurs in areas having an annual mean temp of 22°C and annual rainfall of over 200 cm. Trees in these forests are dense, tall and very green. Leaves of the trees are large, long and have a narrow ending (drip tip). Trees don’t shed their leaves at once. They are same as Tropical Evergreen Forests, ‘semi’ implies these forests are found in the less rainy parts of the tropical region. It has a mixture of Evergreen and moist deciduous trees. Tropical evergreen forests will make a transition to semi-evergreen forests due to human interference or climate change. Some of the tree species of semi-evergreen forests are white cedar, hollock, and kail. Tropical means ‘Tropical Region’, and Deciduous means ‘plants, tress that shed their leaves each year’. They are found in both Tropical and Subtropical region. They are also called Monsoon forests. Leaves regrow during monsoon and shed during summer. These forests occurs in places that receive rainfall between 70 to 200 cm. These forests are found in regions that have rainfall between 100-200 cm. They are found in the states of foothills of Himalaya (West Bengal, Mizoram, Manipur), Chhota Nagpur Plateau (WB, Chhattisgarh, Bihar, Jharkhand), Eastern coastal plains of Odisha, eastern foothills of western ghats (Kerala, Karnataka, and Maharashtra). Trees shed their leaves during dry winter and dry summer due to lack of moisture. These forests are a victim of human activities like – irrigation and agricultural activities. Some common trees include – teak, sal, shisham, hurra, mahua, amla, semul, kusum, bamboo, and sandalwood. Dry means the region where rainfall is lesser (between 70 to 100 cm) than Moist deciduous forests. They are similar to Moist deciduous forest, the only difference is Dry deciduous forest can grow in areas of less rainfall. The forest appears like a vast grassland with naked trees during dry season. At ground level, you will find solid growth of Grass and climber plants. They suffer from overgrazing, forest fire and vast clearance due to agricultural activities. They are found in – Punjab, Haryana, parts of Uttar Pradesh, Madhya Pradesh and South-east of Rajasthan. Basically Central Deccan plateau. Some common trees include – teak, sal, laurel, tendu, palas, amaltas, bel, khair, axlewood etc. Tropical means ‘Tropical Region’, and Thorn means ‘a sharp pointed wood’. It is a dense, and scrub like vegetation. They occur in areas that receive rainfall less than 50 cm (semi-arid regions). Trees remain leafless for most part of the year and water is stored in stem of the trees. They are found in the areas of – southwest Punjab, Haryana, Rajasthan, Gujarat, Madhya Pradesh, and Uttar Pradesh. They are also found on the lower side of the Western Ghats covering large areas of Maharashtra, Karnataka, Telangana, Andhra Pradesh, and Tamil Nadu. Some common trees are – Babul, Palm, Acacia, Kokko, Khair, Khajuri, Ber, Neem, Khejri, Palas, etc. Tussock species of grass is quite popular in this forest. They grow up to a height of 2m. In mountainous region, with increase in altitude temperature decreases. North India – The Himalayan mountains from Jammu & Kashmir – (Sikkim, Assam, Arunachal Pradesh, Manipur, Tripura, Nagaland, Meghalaya and Mizoram) Purvanchal mountains in the extreme east of India. South India – Western Ghats, the Vindhya range and the Nilgiris. Between 4,000 – 5,300 meters – Alpine forest belt exists. Trees like – Silver firs, junipers, pines, birch, willows, primroses, and rhododendrons are found here. Alpine grasslands with herbaceous vegetation and short duration flowers are found at the higher region. Between 2,700 – 4,000 meters – Coniferous Forest Belt exists. Trees like – silver fir, blue pine, spruce, and deodar are found here. Between 1,300 – 2,700 meters – Evergreen Forest Belt exists. Trees like Oaks, poplar, elms, laurel, birche, alders, magnolia are found here. Deciduous forests are found at the foothills of the Himalayas up to an elevation of 1300 m.
Trees like sal, teak, bamboo grow in abundance. Between 3,300 – 5,000 meters – Alpine forest dominates. Alpine plants like – rhododen­drons, sweet grasses, shrubs with cushioned leaves are found here. Between 2,000 – 3,300 meters – Coniferous Forest Belt exists. Trees like – deodar, poplar, spruce, cedar, fir, maple, walnut are found here. Between 1,000 – 2,000 meters – Chir pine Belt exists. Southern slope of Himalayas, thicker vegetation exist due to high rainfall. With increase in altitude (rainfall to snow), the vegetation turns into Tundra vegetation. Mountains in South India are mainly found in the Western Ghats, the Vindhya range, and the Nilgiris. They are Tropical region and their elevation is around 1500 meters above the sea level. Lower regions have Subtropical vegetation or Moist & Dry deciduous forests due to less rainfall (leeward side). Some trees that are found here are – Teak, sal, shisham, Mahua, Bel, Bamboos etc. Higher regions of these mountains have Temperate forest or Evergreen forest vegetation due to good rainfall. These Forests are called sholas in the Nilgiris, Anaimalai and Palani hills. Some trees of these forests are – magnolia, laurel, cinchona, and wattle. Littoral and Swamp means ‘wetlands’. 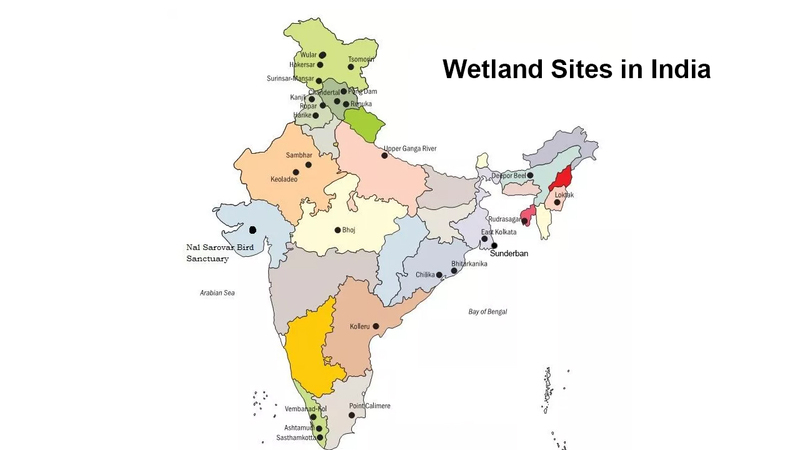 In India, wetlands exists in the Himalayan region, desert, coastal plains, and near river plains. These are found in – Sunderban delta, Eastern coastal plain of river Godavari, Krishna, Kaveri, Mahanadi, desert region of Rajasthan and Gujarat, Kashmir and Ladakh, Andaman & Nicobar islands, Lakshadweep islands, Western coastal plains of Malabar coast to Konkan coast. There is an intergovernmental treaty for the protection and sustainable use of the wetlands, it’s called the ‘Ramsar Convention’. India currently has around 27 Ramsar sites.